These sun catchers look really pretty on the window, and made with brightly coloured Hama beads they are a lovely way to welcome some Spring sunshine! To make these sun catchers I used beads from the Hama beads box of pastel beads (affiliate link) . This is a large tub with 10,000 beads in six lovely bright colours, plenty to keep you going and a nice change from the solid colours. It's worth keeping an eye on the price of this tub as I've found that it can vary widely, I always stock up when I see them on special offer! 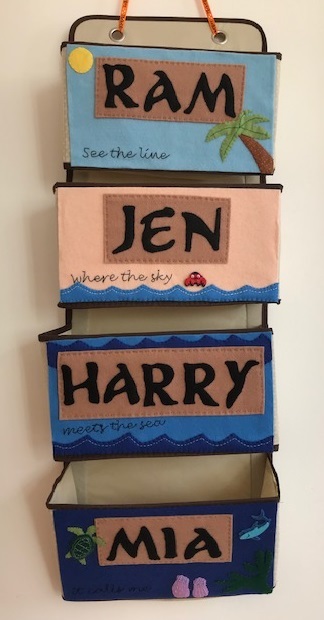 The pegboard is the Hama bead Easter egg board (affiliate link), a nice sized board that can be used to make eggs in a variety of different sizes. I found that a border with three rows made a good sized frame. I ironed the design on both sides. When the beads are still warm it's easy for the egg to become a little out of shape, so be careful when you remove it from the board. After ironing, place the egg frame between two books or similar to keep it flat while it cools down (I use two cork mats and place the iron on top to hold them down). This will stop it curling and make sure that it cools to a nice shape. Then gather together some pieces of tissue paper. I have a big bag of coloured mini tissue squares (affiliate link) which I use for various crafting projects, so I went through and pulled out a selection of pastel colours which I thought worked well together. You will also need some clear sticky backed plastic. I found that the easiest way to make the sun catchers was to tape a piece of clear sticky backed plastic to the table, sticky side up. Then cover with the pieces of tissue paper. This is a really easy way for young children to make a sun catcher, as it doesn't matter if the pieces become crumpled and they stick down really easily. Then stick a second piece of sticky backed plastic over the top so that you have a nice smooth surface for each side of the sun catcher. Cut each piece roughly to size for the frame, then use some white PVA glue to stick the Hama bead frames to the plastic insides. Leave to dry thoroughly, I found that placing the eggs on a radiator made sure that the glue was completely dry. Then when dry, cut to size neatly around the egg. The egg can be stuck to the window easily using blu tack, or you might want to attach some ribbon or string to the egg through one of the holes in the top and hang from a window handle or suction hook. 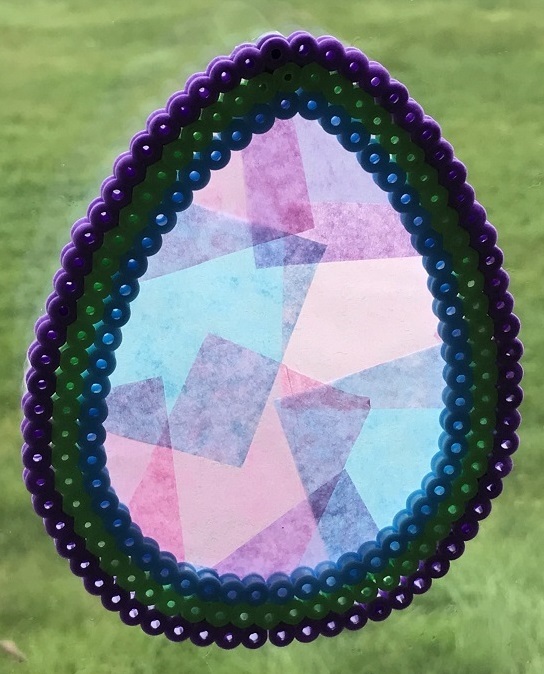 I also used the Easter egg pegboard to make these Hama bead and paper plate decorations, and you can see all of my Hama bead projects on my Hama bead page.